The Kite Festival was held on 14th January 2012 from 3-6pm at the ground opposite Basho’s restaurant, Koregaon Park in partnership with Santulan. Santulan had a registration desk and entry fees were 150 rs which included 3 kites, ‘Manjaa’(The thread used to fly kites ), and complementary coupons for snacks and tea. At the kite distribution stall, people were requested to write anti-drug slogans on the kites before flying them. There was a DJ playing music as people flew their kites and showed their support for Santulan. There was also a graffiti wall on which people were encouraged to write anti-drug slogans and various game stalls. 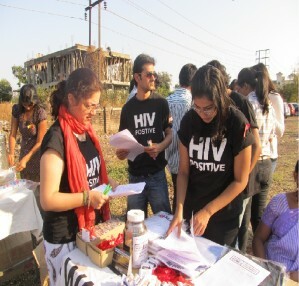 Volunteers from Wake Up Pune spoke to people and distributed surveys on HIV/AIDS. They also distributed red AIDS ribbons to symbolise their support for the fight against HIV. Santulan had a both to give out information on alcohol and drug addiction. A psychiatrist and de-addiction counselor were also present to speak to people about the risk factors of addiction and vulnerability to HIV. Some members of the DISHA team were present and performed a street play to raise awareness about HIV/AIDS. The money raised from the event will be used to support Santulan’s new de-addiction center.